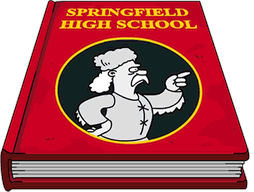 ← Where Did THAT Come From – Springfield Jobs Act 2 Characters! As 2018 rolls on through so do the mini-events. We’re now into our third mini-event of the year and this time around it’s a revival of the classic, Who Shot Mr. Burns? 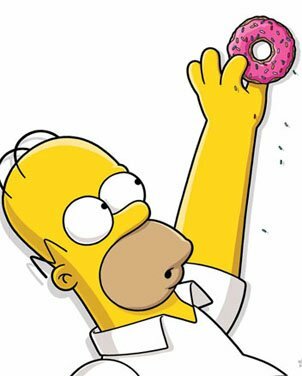 Yes, we’re tackling the never before seen Part 3 of the Simpsons classic. With a few interesting (read that as weird) twists and turns along the way. 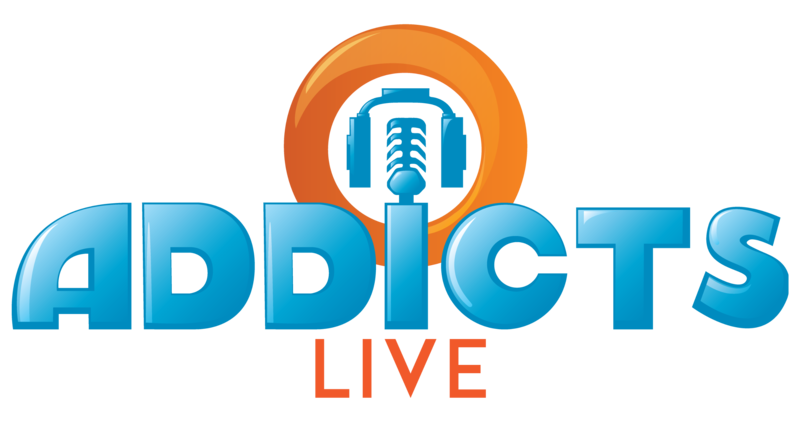 Of course, as we’ve said over the last few years, mini-events have become low stress “events” so you can enjoy some relaxing downtime in TSTO, but still have something to keep you tapping every so often. Remember, this event is designed to follow a series of tasks via the questline to unlock prizes. For each of the parts of the Who Shot Mr. Burns? 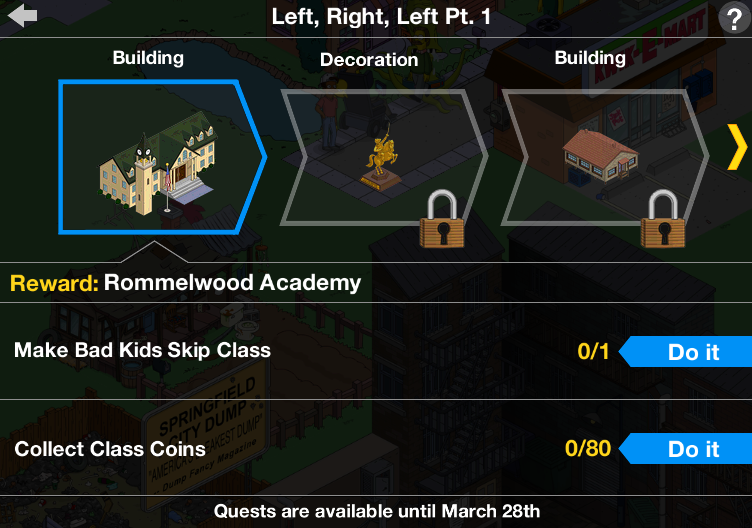 (Part Three) questline, you’ll have to earn via various character tasks in order to unlock the prize for that part. Size: 11×11, fairly tall. About the height of a regular building when not active. What Does It Do: Animated when tapped. Arm comes up and it “blocks” the “sun” temporarily…for like 5 seconds. Then it goes back to resting position. And that completes the details of the fourth Who Shot Mr. Burns? (Part Three) prize! What are your thoughts on the Sun Blocker 2? 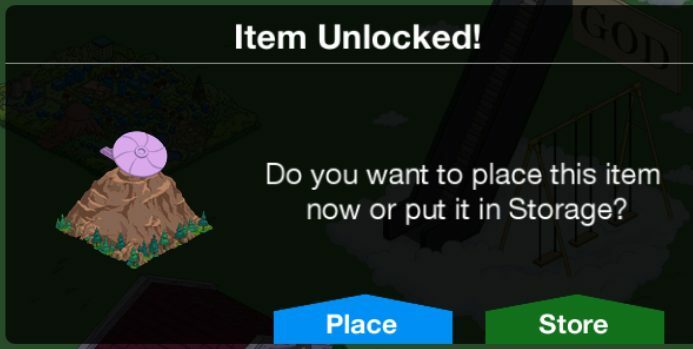 Will you be using it in your Springfield or storing it once the event is over? If you have placed it, where have you placed it in town? Sound off in the comments below, you know we love hearing from you! 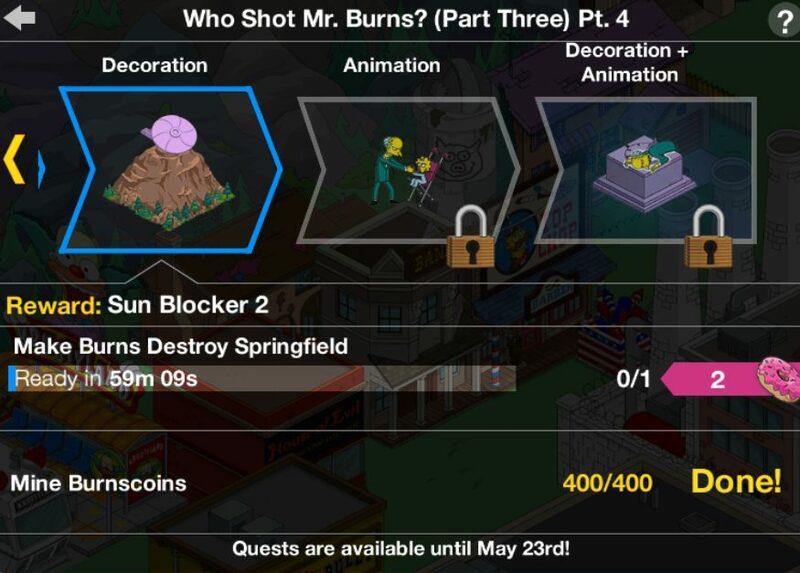 This entry was posted in Tips and Tricks, Updates, Who Shot Mr. Burns 2018 and tagged does the sun blocker block the sun, how do i get the sun blocker, Tapped Out Mini Event, Tapped Out Tips and Tricks, The Simpsons Tapped Out, TSTO Addicts, TSTO Tips and Tricks, what does the sun blocker do, who shot mr burns mini event, Who shot Mr Burns questline. Bookmark the permalink. I think the Sun Blocker would of worked better as a decoration for the mountains similar to the Homerlayas and the Monorail Tunnels because other than the mountains I don’t know where else this could look good in Springfield. The only prize from this event that I think I will keep out would be the Sundial because of the 3 hour visual task with Burns and it is more easier to fit into Springfield. Yes, I was thinking the same – I like the concept but it’s difficult to place. Being part of the mountains would have made so much sense! Agreed with you it would be best by the mountains, but I found a nice spot for it near my dam and springfield gorge. This is the prize I’m most excited about getting. In a classic woolies wdtcf..
A night mode could be implemented vibrantly without dimming the screen–that’s just dark mode. The Simpsons is a cartoon. Artists use alternate colors to signify nighttime. (Google “Simpson’s house at night.”) EA would simply need to select alternate colors for each native color, leaving Characters unaffected, as in the show. A reload would be required but this is basic programming. Yes, lights could ‘illuminate’ by adding difussion to Items like lamps. Missed opportunity. Understandable but I actually like the Item. It does, however, rival Murderhorn as the most comically undersized Item in TSTO–compare its pine trees. 😅 Bring on the Embiggulator, Professor. Very true! I’d also like the shrink ray to make some other items smaller. It’s sometimes like using Duplo bricks to build in a city full of LEGO buildings… but at least the people are the same size LOL! …embiggulate the stadiums and mountains. Presto. Scaling starts to make sense in the game. That just can’t work! Your padular device would never fit in your pocket! Awww come on….there’s other useless junk (burns’ pile of gold/money for example…)This is at least from an awesome episode! And it DOES something…..and was free…..and goes good in the mountains….and…and….. I agree… I think it is pretty clever. I never have finished my Burns Money Pile…talk abut useless…and I only did my Cecil improvements long enough to get the damn dam. The sun blocker is FAR from the dumbest thing we have received for free. The best part of the money mountain is the chance to advance levels quickly, just don’t forget to turn on the xp collider…then spend, spend, spend😄. Better than Rat Trap Trucks.…except you can’t sell it back, so maybe not exactly better. Also, I discovered that you can buy and sell the Sunsphere for XP farming…a lot slower, but a one time shot for a huge return. Then buy it again…repeat as needed. I want a night mode just because its a new feature. Animated buildings light up in use. Unrelated but I can’t seem to find my squidport characters in store. Any idea were they would be? I true “night” mode would turn on the street lamps and the lights of many if not all the buildings. It might also add stars and moon. And it might add something to the observatory. Maybe in 20 years after EA runs out of ideas they may do it.